(Nanowerk News) Researchers at the Institute of Experimental Physics at TU Graz have investigated the detailed structure and thermodynamic behaviour of nano-cluster structures since 2012. Very clean nanoparticles of various metals or metal oxides are produced by a so-called “pick-up” technique where helium droplets at a temperature very close to absolute zero are loaded with atoms or molecules from an evaporative source which then agglomerate to form nanoparticles inside the droplets. The team at the Institute of Experimental Physics led by Institute Head Wolfgang Ernst and Andreas Hauser used this method to study vanadium oxides and their clusters. The scientists and their team achieved a breakthrough regarding the structure and thermodynamic properties of vanadium pentoxide. These results contribute to a better understanding of the stability of vanadium oxide nanoparticles that can lead to an improvement in the production of so-called SCR catalytic converters and their application, for example, in industrial plants, power stations and combustion engines. The work has just been published in Chemical Science ("Vanadium(V) oxide clusters synthesized by sublimation from bulk under fully inert conditions"). Vanadium oxides are extremely important for catalytic reduction of the nitrogen oxide content in exhaust gases and also play an important role in the oxidation of hydrocarbons. Of all the vanadium oxides, vanadium pentoxide V2O5 represents the most valuable catalytic compound. In their investigations at the Institute of Experimental Physics, the researchers studied the evaporation of pure V2O5 powder in detail. They analysed the sublimated particles with the help of the above-mentioned helium-droplet technique. “Despite investigations on vanadium oxides over many decades, it had never been clarified whether individual V2O5 molecules evaporate, whether vanadium atoms escape from the substance, or whether other fragments with different vanadium and oxygen proportions are released,” explained Wolfgang Ernst. Ernst and Hauser were able to prove for the first time that the evaporation takes place preferentially in units of V4O10. In other words, dimers of molecular building blocks evaporate and not individual V2O5 molecules. The results are also of great importance for the catalyst industry, especially as the Graz scientists have shown through their measurements that they can evaporate vanadium oxide without altering the stoichiometric composition of the solid. 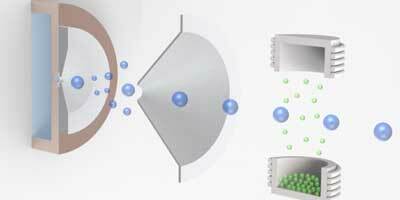 This is the basis for a new method in which metallic nanoparticles can be coated with V2O5 particles. It would enable the production of more efficient and cost-effective catalyst materials for the reduction of nitrogen oxides. Tests on selected gas mixtures and follow-up experiments on vanadium oxide-coated metal clusters are currently in progress at the Institute of Experimental Physics.